highly technical demands of the professional musician. 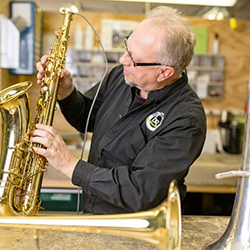 We offer a yearly comprehensive maintenance program for individually owned and school owned instruments that offers an economical way to maintain the instruments in top quality playing condition year round. These same professional technicians, along with a team of our technical preparation assistants, process all of our rental return instruments.